The Aprilaire Dehumidifier 1710 is an appliance specially designed for use in a crawl space or basement. Its low "boxy" shape gives it a very different appearance from the more familiar portable models from companies such as Danby and Frigidaire. The 1710 is different inside as well as out. It will perform effectively in cold conditions and costs less to run, per pint of moisture removed, than any portable. This is because it is built to higher standards using larger, better quality components. As a result it is heavier, will last longer and is much more expensive to buy than a portable unit. Priced at well over $1000 the Aprilaire Dehumidifier 1710 represents a considerable investment. Spending this amount of money can be justified if the conditions in your basement or crawl space are unsuitable for a less sophisticated, portable model but are there better choices? While the 1710 is a sound choice it does have a couple of disadvantages. It is not Energy Star qualified which means that other models which are, such as units made by Therma-Stor, are more energy efficient. It is not suitable for ducted operation. On the plus side the 1710 is probably the quietest crawl space and basement model available at this time and it is made in the USA. I will return to the pros and cons of choosing the Aprilaire Dehumidifier 1710 in my recommendations at the end of this review. 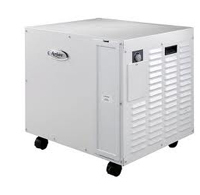 The Aprilaire Dehumidifier 1710 is designed for large areas of up to 2000 square feet and will be equally effective in a large crawl space or basement. It will perform well in temperatures as low as 50°F but for even cooler areas only certain commercial models should be considered. If you are looking for a unit with low temperature operating capability for a significantly smaller area, a garage for example, the 1710 is much more than you need and there are cheaper alternatives which you may wish to consider. Consumer reviews of the Aprilaire Dehumidifier 1710 are generally positive although there are a few which report defects in the appliance when delivered. Reviewers are unanimous in praising the effectiveness of the 1710 and there is no doubt that this model will do what its manufacturers claim. The next most appreciated feature of the 1710 is its relative quietness and this has clearly influenced the buying decisions of users for whom this is a top priority. I can confidently recommend the 1710 as a sound, generally reliable and effective choice for your crawl space or basement provided that the area and ambient temperature of your space fall within the specified range of this appliance. If you are looking for a stand-alone model that will do its job and be reasonably quiet the 1710 may be the model for you. I have no particular reservations about the 1710 but I believe that for a significant number of you there are alternatives which may be even better. In a large crawl space the use of ducting will improve the air distribution and, thereby, increase the effectiveness of any model you may choose. This option is missing from the 1710. Energy Star qualification is a guarantee that a qualified model reaches a minimum standard of energy efficiency. The 1710 is not Energy Star qualified. For an almost exactly equivalent alternative model at a similar price, with both Energy Star qualification and suitability for ducting, you could consider the Santa Fe Advance from Therma-Stor. The Advance is every bit as good in all other respects but it is considerably noisier. If I was looking for a unit in this class I would choose the Advance in preference to the Aprilaire Dehumidifier 1710 and you may wish to consider the merits of both models before making a final decision.